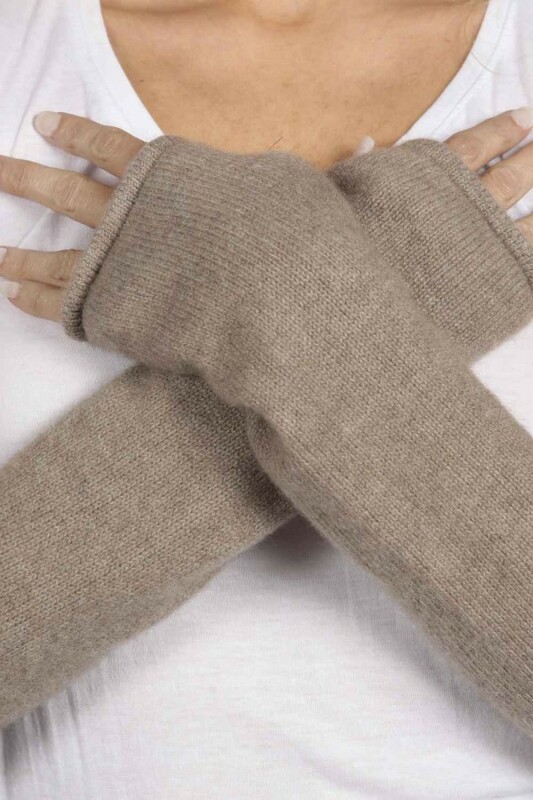 Our Camel Brown pure cashmere fingerless wrist warmers are knitted in Italy with 100% cashmere wool. Great quality at great price, directly from the studio. Our Camel Brown pure cashmere wrist warmers add and extra warmth to your outfit. You will be amazed by the softness and by the comfort you can experience when wearing them. Plain knitted with a stylish roll edge, these fingerless cashmere gloves are long and can be worn long or folded back if you prefer. Great quality at a great price, they come in a classy signature rigid box. Knitted in Italy with 100% Mongolian cashmere wool. Match them with our Camel Brown cashmere beanie and any other Camel Brown cashmere poncho and Camel Brown cashmere top for a perfect outfit. You can either hand wash or machine wash with delicate setting.